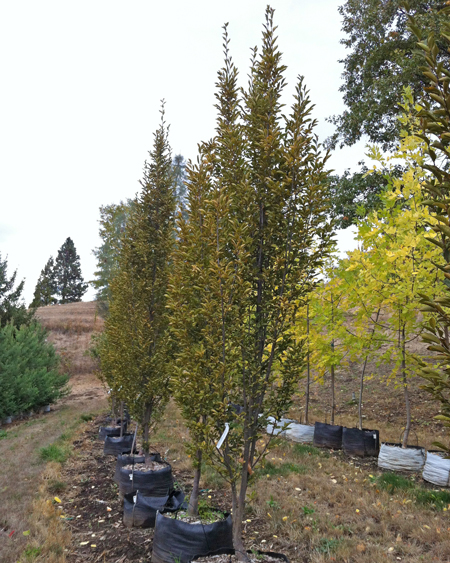 One of the most commonly sold cultivars, this tree is a widely loved choice for a variety of Landscaping needs. Lacking a central leader, it fans out into a very densely foliated, columnar shaped three, which makes it ideal for use as a hedge, screen, or windbreak. It's textured leaves are alternate, double serrate, and range from 1.5 to 3.5 inches long. They boast a dark, rich green color throughout the summer, and then fade into a rich yellow in fall. Their flowers are a creamy white-ish gray, are not showy, and are followed by small, oval-shaped, hard brown fruits that attract birds. Another bonus characteristic of this tree is that there is not a significant mess created from the shedding of leaves and fruit. The bark is smooth, gray, and rippling, and it protects the tree's significantly hard and strong wood, which was reportedly used by ancient Romans in making chariots and by American pioneers for oxen yokes. Use this awesome species in parking lot islands, containers, highway medians, hedges, screens, streets, sidewalks, and lawns! It prefers full sun to partial shade in almost any well-drained soil. This tree is highly drought, pest, and disease tolerant as well!